Friends are rather useful to have around. They’re great for your social life, and your love life too, as Jagdeep Daheley fully realised when he met Harpreet Kalsi through a mutual connection at London’s Royal Exchange a little over two years ago. Friendship blossomed into something more, and soon Jagdeep, also known as Jags Daheley Drumline, the co-founder of Drumline Dhol Group, and pretty Harpreet were a fully-fledged item. Soon after the couple celebrated their two-year anniversary, Jags decided the time was right to pop the question. He spared no expense, booking an entire restaurant in central London and having it decorated with flowers and candles with just a single table set for two in the entire space before getting on bended knee to ask Harpreet to spend the rest of her life with him. Through tearful eyes, she said yes. After partying in Las Vegas and Spain for their stag and hen parties, the couple began planning their wedding. With a career in the entertainment industry, Jags was lucky to call upon his many friends and connections to help him with his own nuptials. Aman Dahele, one of three best men (the others were Gagan Josun and Jazz Bhambra), used his graphic design skills to create 24 carat gold foil printed wedding invitations for the couple, as well as a bespoke designed insignia that featured on the invites and dance-floor. Guests dined on traditional dishes by Preeti Catering after the moving Gurdwara wedding ceremony, making sure they left plenty of room for Barfia’s delicious sweets. The company made over a thousand pieces in an array of shapes, sizes and flavours. The couple also arranged for popcorn, candy and sweet stations from Butterfly Sweets to set up at various points around their venue, in case any guests felt a little peckish. Jags and Harpreet decided on Kudos Music as their Big Day entertainment. DJ H, Jas Johal and Rajiv B provided a medley of music and said that it was the grandest production they had ever done. 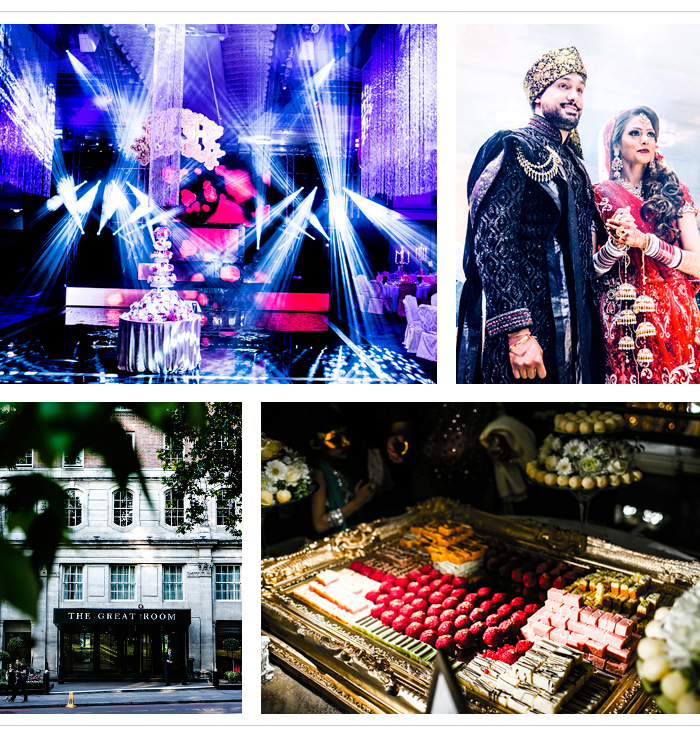 The couple’s wedding was so large scale that it required two large lorries loaded with equipment an entire two days to set up the lightshow using a mix of the venue’s own lighting as well as Kudos’ bespoke kit. And of course, Jag's Drumline Entertainment - a cavalry of 23 Dhol players - played live, led by one of his best men and cousin 'Jazz Bhambra'. Of the many highlights of the reception, one of the standouts was the wedding toasts. Five of Jag’s best friends paid homage to the newlyweds, but it was when the groom rose for his speech, that the room became spellbound by his heartfelt words. Jag’s endeared himself even more so with his new in-laws by ending his address by saying: “Thank you, for raising the most perfect woman I could ever imagine”.